My brother-of-choice and dear friend, Shawn Gore, is a rising star in the RPG world, and I recommend you keep an eye out for future work from him. He’s the writer and designer of this scenario, which links the Continuum world of Shaintar to Ainerêve in a plot-point campaign. The worlds of Ainerêve and Shaintar collide as agents from both worlds fight to gain a foothold and secure more power. Help assist a group of rebels trying to break free from the tyranny of the Kal-A-Nar Empire, but find that a much deeper plot and more powerful foe work in the shadows. This adventure is a crossover event written to bridge the worlds of Ainerêve and Shaintar. The module is written in a “plot point” campaign style, allowing the GM to sculpt the specifics of each encounter. It can be used for a wide range of player/character/gm experience levels, and run with any rule set that a GM desires. However, it is suggested to use either Eldritch RPG (Revised) by Crossroads Games, or Savage Worlds by Pinnacle Entertainment Group. 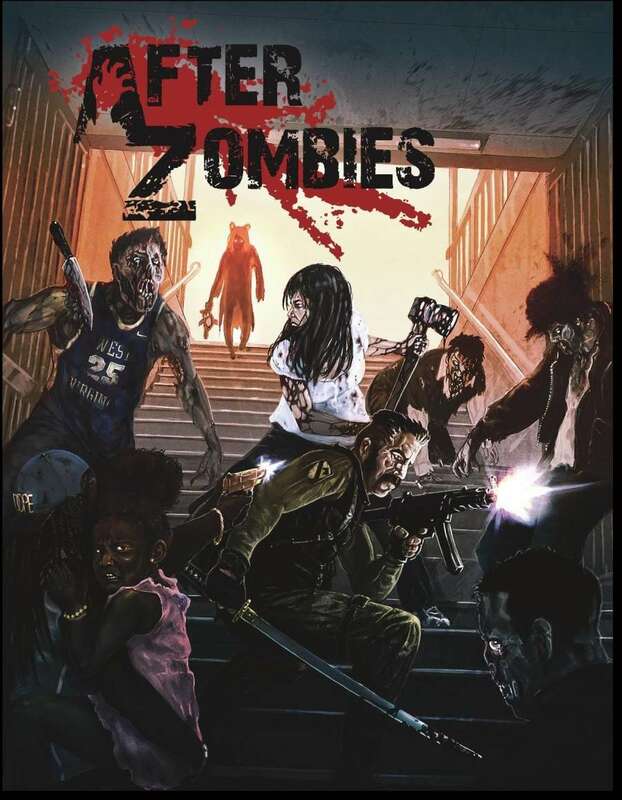 With a focus on people simply being who they are in the wake of a zombie apocalypse, industry veteran Charles Rice brings his own special vision to this still-popular genre of end-times gaming. The world as you know it is gone. In the wake of a terrible disease, the dead have risen to walk the Earth and humans are no longer at the top of the food chain and civilization has collapsed. Welcome to the world AFTER ZOMBIES. After Zombies is a d% RPG with no character classes. All skill and combat checks are rolled on percentile dice and 2-5 d10’s are all you need to play the game, along with pencil and paper. Advancement is based on survival by any means necessary. Hide. Run. Fight. It makes no difference. Surviving one more day is all that matters. Fans of the 20th Anniversary Edition of Shadowrun will appreciate this collection of tons of material from other sources, updated and expanded with new stuff. You’ve got the talent. You hopefully have lived long enough to collect a decent amount of nuyen. So show it off! Get a better gun. A bigger boat. A zeppelin that can sneak you across borders where no one thinks to look. All these toys are here, and many, many more. 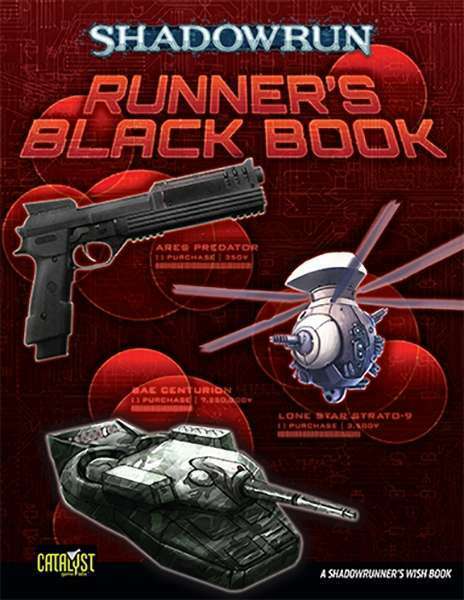 Runner’s Black Book is a shopping catalog for the ambitious and successful runner—and it’s a guide to the weapons, drones, and vehicles that the various forces of the Sixth World may send against you as you sneak through the shadows. Runner’s Black Book collects material from Shadowrun’s successful PDF line of products, compiling Deadly Waves, Gun Heaven, MilSpecTech, This Old Drone, and Unfriendly Skies in their entirety, along with updated art and information. On top of that, the book includes new pieces of gear developed specifically for this volume, including the punishing Kriss X Submachine Gun and small, smooth TPP light pistol. Each piece of gear is accompanied by a full color illustration providing a look at the item’s complete details and features. Runner’s Black Book is for use with Shadowrun, Twentieth Anniversary Edition. One of the best things about 5e is how easy it is to port over material from previous editions; just boil down the concept to the essentials and interpret it for the foundationally easy core of D&D’s best iteration (in this gamer’s humble opinion). This particular tome is well worth the effort, chock full of game-changing ideas. This one’s featured on the Dungeon Master’s Guild (remember; your log-in for DriveThruRPG is the same for the DM Guild). 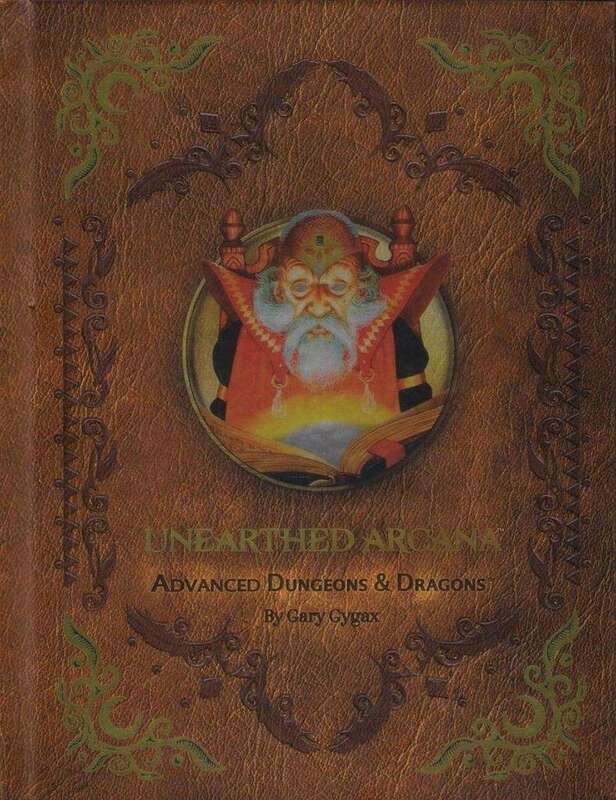 The original 1985 release of Unearthed Arcana™ changed Dungeons & Dragons® forever by introducing new races, classes, magical items, and rules written by Gary Gygax. This new printing will appeal to nostalgic D&D® fans looking to add this classic to their collections. The most complete version of Unearthed Arcana ever printed! The original Unearthed Arcana was corrected and updated through articles published in Dragon® magazine. Completists will want to pick up this version because it has been, for the first time ever, painstakingly edited to include the original errata and supplements created in the 1980’s under the supervision of Mr. Gygax himself. Origins (I): Gygax Waning. Gary Gygax’s major contributions to the D&D game began to fade around 1980. A few last Greyhawk adventures appeared, thanks largely to Rob Kuntz coming on board in 1981 to finish up S4: “The Lost Caverns of Tsojcanth” (1982) and others. But other than that, Gygax just didn’t have the time to produce gaming material, first because he was running TSR Hobbies and later because he was off in Hollywood, running TSR Entertainment. As a result, others picked up the mantle of leadership in TSR’s design studio: Lawrence Schick created the studio and brought on Basic D&D designers David Cook and Tom Moldvay, then Gygax’s hand-picked right-hand-men Frank Mentzer and Francois Marcela-Froideval led much of the D&D design work afterward. A Different Sort of Players Handbook. In 1985, AD&D had been around in a “finished” form for six years. The only hardcovers released during that period were books of deities and monsters, not rules. These were also the years of D&D’s greatest growth, so it’s pretty safe to say that by 1985 most players of AD&D never knew anything but the status quo. This is why Unearthed Arcana was entirely ground-breaking to those fans; it was the sort of revamp of the system that most players had never seen. Now, players delved into what was essentially a supplementary Players Handbook, full of new character classes, new races, and new rules. The changes were so large, thatUnearthed Arcana is now used to mark the beginning of AD&D 1.5e, an expansion of the core game that also included Oriental Adventures (1985), the Dungeoneer’s Survival Guide (1986), and the Wilderness Survival Guide (1986). Unearthed Arcana has a section for GMs too — a split that would be repeated through several of the later AD&D hardcovers. However it was the player’s section that really revamped and relaunched the game. Expanding D&D. Unearthed Arcana is full of expansions to the D&D game. Besides the aforementioned new classes and new races, AD&D also picked up a 7th attribute, Comeliness — which was meant to be different from Charisma, but was never that popular. Unearthed Arcana also contains plenty of new magic items and spells, including the introduction of 0-level cantrips — an idea that’s been much more long-lived. Kind of a “Holy Grail” for long-time gamers, the idea of a caper-oriented game – heists, criminal enterprises, super-spy operations – is usually stronger in the mind than at the table, where everything breaks down into long, over-analyzed, argued-to-death planning sessions by folks who frankly don’t have the actual experience or know-how to actually plan an operation like this. Looks like someone’s taken a very interesting crack at the problem with an increasingly-popular effort. They’ve also taken the interesting approach of letting you into the process before they’re completely done with it. This is the digital early access edition of the game. 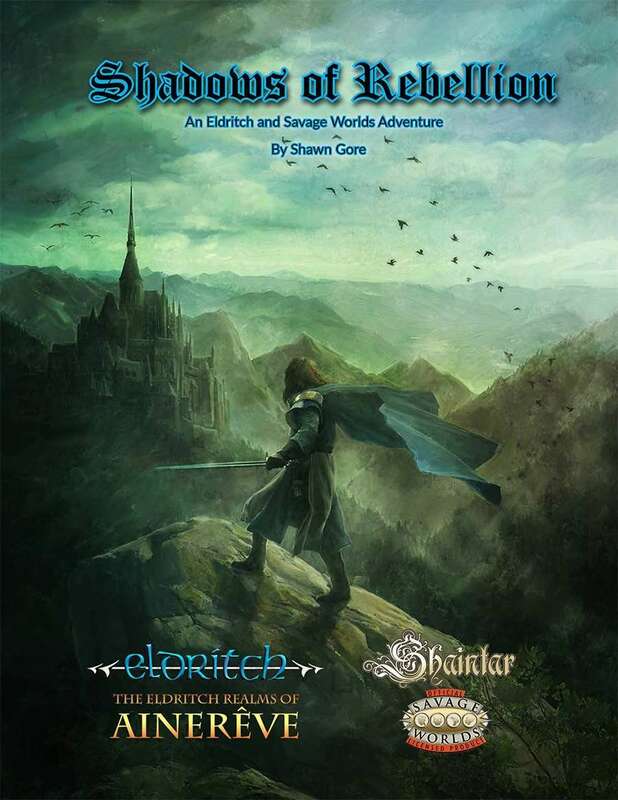 When you purchase this product, you’ll receive a PDF of the game in progress as well as every update of the PDF including the final, complete version of the game book. If you’d rather wait and buy the game once it’s fully finished, then this product isn’t for you! If you want to jump in and start playing now with the core materials of the game, then this PDF will serve you well. 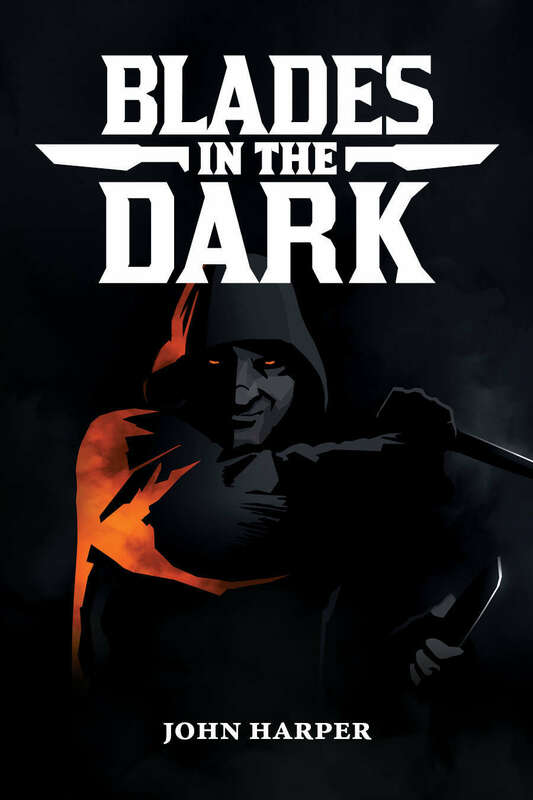 Blades in the Dark is a tabletop role-playing game about a gang of criminals seeking their fortunes on the haunted streets of Duskwall. There are heists, chases, occult mysteries, dangerous bargains, bloody skirmishes, and, above all, riches to be had if you’re bold enough. You play to find out if your fledgling crew can thrive amidst the threats of rival gangs, powerful noble families, malicious ghosts, the Bluecoats of the city watch, and the siren song of your scoundrel’s own vices. Gameplay focuses on criminal endeavors called scores. A session of play usually consists of 1 or 2 scores, each followed by recovery, downtime projects, and advancement for the scoundrels and the crew. In Blades in the Dark, your crew gets its own “character sheet” (chosen from different crew classes, like Cult, Thieves, or Smugglers), earns XP, and levels up alongside the characters. As you advance the crew, you unlock new options and abilities for the scoundrels and climb up the ladder of factions within the city. The game features a robust core resolution mechanic which asks the group to characterize actions as desperate, risky, or dominant. Each choice provides a range of multiple outcomes, beyond simple success or failure. To highlight the roguish nature of the characters, players can accept a devil’s bargain (a bonus die with strings attached) to bolster their chances. A good teamwork system is critical to making a game about a crew of scoundrels work. Blades in the Dark features a fun and intuitive teamwork mechanic that shifts the spotlight from one character to another as they go “on point” with their teammates backing them up. Many RPG sessions grind to a halt when planning is required. The group ends up discussing options for hours — talking about the game rather than playing the game. Blades in the Darkcuts through all that with a lightning-fast planning technique that takes less than one minute. You make a few simple decisions and you’re off and running. In addition, the players can use flashback scenes to roll for a setup actions their characters performed in the past.